What is BodyBeat Pulse Solo? With the Peterson BodyBeat Pulse Solo vibe clip you can play in sync at almost any tempo without hearing the tones. Just connect it to the audio output of your iPhone or smartphone. The BodyBeat Pulse Solo converts the tones into a clear pulse that you can clip to your belt, or other desired location. Its USB-rechargeable battery offers long-lasting convenience. 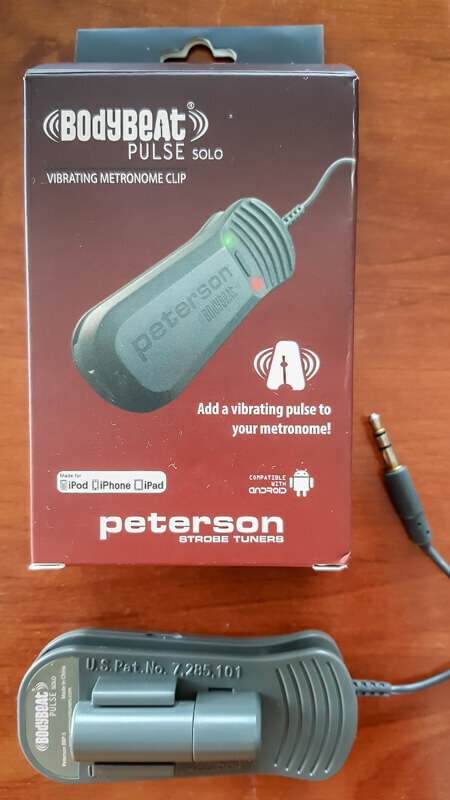 In situations where you can’t or don’t want to audibly hear your tempo, I recommend the Peterson BodyBeat Pulse Solo metronome accessory if you have some difficulty to feel the vibration of your phone. It works very well! 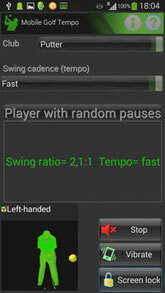 How to use it with Mobile Golf Tempo Training App? First of all, if you are using an iPhone, DO NOT FORGET to turn off the mute button! My iPhone’s volume must be set at very high. My Samsung’s volume must be set at high to very high. — select short tones (pre-shot and normal sequence). — If you use pre-shot sequences or no human reaction time, a very fast tempo will not be properly converted. — Do not forget to turn the BodyBeat ON! — Depending on your tempo, distinctive differences in intensity will be felt for backswing, downswing and impact. — Two levels of vibration intensity, both stronger than my phones (I use low intensity). Controlling the distance on your wedges will give you more achievable putts (birdie or par) and help you avoid three putts and tough chips. You really need to work out this skill the most at the driving range! A tour pro will swing with the same tempo each time and let the backswing length and wedge selection determine the distance. You can use the 3 x 4 system explained in the Dave Pelz's Short Game Bible: “3 swings times 4 wedges (loft: 51°, 55°, 60° and 64°) equals 12 distances”. In this system, the backswing lengths are based on the clock face, with hand positions at 7:30, 9:00, and 10:30. You can add 12 more distances by gripping down on the shaft about 4 to 5 inches. Theoretically, for a wedge shot, the swing ratio* will vary depending on the length of the backswing. 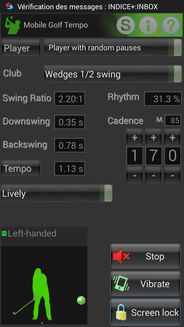 Since it can be difficult to remember so many different tempos, in practice many pros memorize only one tempo for all their wedge shots with a swing ratio that varies between 2.1:1 and 2.4:1. As they can count on the same tempo with every short game shot, they reduce the complexity of the puzzle by half. By using this swing ratio you will get the feeling of an aggressive but not hard acceleration through the ball. A correct swing motion: leave your hands out of the swing and execute a synchronised backswing (there is no coil, hips and shoulders stay in sync) with wrists fully cocked and a complete follow-through. Dave Pelz calls it a Dead Hands Finesse Swing. It might take a lot of practice to become skilful with this swing, but it'll be worth the effort. The setup and alignment of the body are crucial. *The "swing ratio" refers to the ratio of the measured time in seconds it takes to make the backswing, to the measured time in seconds it takes to make the downswing until impact. At the driving range: Once you have mastered the finesse swing with a constant tempo and a swing ratio between 2.1:1 and 2.4:1, you need to know exactly what distance a natural unforced 10:30 wedge shot goes for you and practice that shot. Do the same for 9:00 and 7:30 wedge shots. Write and tape upside down on the shaft of your wedges your 7:30, 9:00 and 10:30 distances. So, you will be able to read them while holding the club and ensure that you have the right club for your next shot. I recommend that you only write down your carry yardages. Before playing a round, you need to calibrate your wedge shots to the today’s weather conditions (do not forget that the ball will fly less far at cooler temperatures). - The feedback you get from this system is what develops your feel. - Your wedges should perform the same way whether you use them on the course or in the practice area. Therefore, keep your grooves clean to spin the ball as much as possible during practice and on the course. How to control distance with your putter? Distance control is the most important aspect of putting and separates good putters from bad ones; it comes from a consistent tempo, not the force at which the ball is struck! Before playing a round, you need to calibrate your stroke to the today’s green speed of the golf course. Practice your putts with 4 backswing length on uphill, downhill and level lies and count your paces. Four backstroke lengths means four distances expressed in number of paces. Before making a putt during the round, you only have to count the number of paces between the ball and the hole in order to know the backswing length, but always keeping a constant tempo.